A handicap sink and vanity are accessible bathroom fixtures that must be chosen and installed correctly in order to provide safety, easy access and useful control for any disabled user. to professional guidelines to ensure proper use. many ADA compliant sinks on the market. that are built especially for disability use. 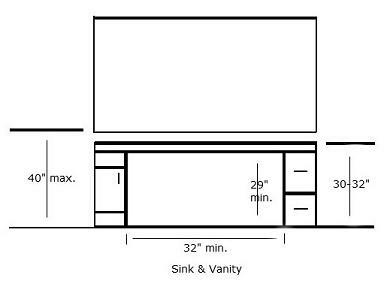 sink and vanity. Issues such as the height of the sink, the tilt of the mirror, the faucet style, and safety features such as scald guards and grab bars are all very important. Of course, the first place to start when determining what type of handicap sink and vanity you want to install, is to consider the needs of the disabled person for whom you are designing the bathroom. If he or she is in a wheelchair, then you will need to make even more modifications. If the person is mildly disabled, then it may not be necessary to make such extensive changes or add more features. In a universal design bathroom, however, many of these design recommendations are already built into the original plans so that you won't have to do very much to achieve an accessible bathroom. So, if you're in the process of building a new home or adding a bathroom for the disabled onto your existing home, you may want to simply go by universal design principles, which can be advantageous to everyone in the home. Choose the sink according to the disability needs. You may or may not need to meet ADA sink requirements, depending on the disability. You should also be careful about the surrounding cabinets, drawers and vanity area, if there is a wheelchair or walker involved in the use of the area. 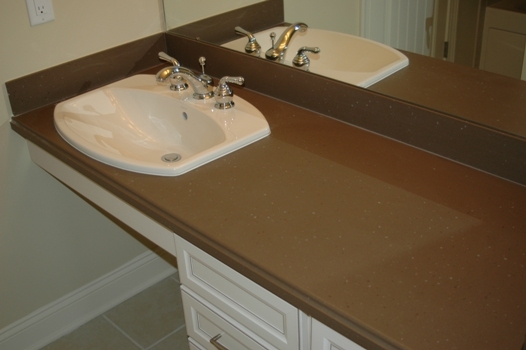 As safe way to go is to choose an ADA sink that is easy to maneuver under and around. These are also more shallow in the front and deeper in the back for easier access. Keep in mind that universally designed bathrooms are built with these issues in mind and make it easy to construct a bath area that is accessible. higher than 29" from the underside for wheelchair users. The opening under the sink area to allow for the proper approach space should be no less than 32" wide for wheelchair use. Standing users will only require a height of no more than 34-36" for ease of use. than 21" deep for easy reach from the front. Also, use C-shaped pull handles or use magnetic touch latches that are easy to open. Those with limited mobility or hand strength can more easily access the drawers with these types of latches, rather than conventional knobs. attached 30-32" from the floor provides ideal access. simple, rubber plug is the best solution. Single lever style faucets - It's a good idea to replace double-handle faucets with single lever style faucets that can be operated with less effort. Motion sensor faucets - Even better, is to install a motion sensor faucet for handicapped users who may have limited hand or arm strength. Pull-out sprayer - Another useful option is to install a faucet that includes a pull-out sprayer that can be used to wash hair without having to get in a shower or tub. 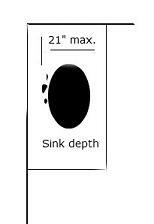 If you have trouble installing a handicap faucet to the back of a vanity or countertop that is 21" deep, you can always install it to the side instead. This provides much better access. When you install a mirror over the vanity or sink area, be sure to set the bottom of the mirror no higher than 40" from the floor. A tilted mirror is usually best for those in wheelchairs or for those who are short. It can then be adjusted to the proper height for each user. mounted mirrored cabinets or medicine cabinets. For disabled users who have dull nerve sensation or slow reflexes, it is very important to design the right handicap sink and vanity space in your home bathroom not only for accessibility, but for safety as well. This type of bathroom can be quite stylish and usable for every member of the family, if you adhere to good design principles that address everyone in the home.